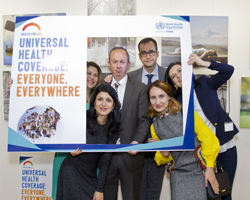 Working towards universal health coverage is a priority of WHO Armenia. The WHO Country Office, Armenia was established in 1994 in Yerevan to support implementation of WHO’s work in the country. The Office is the focal point for WHO activities in Armenia. The country team consists of eight people, including professional staff working on health systems, communicable diseases, and noncommunicable diseases.